Review For years this particular Mac user preferred to carry around an X-Series ThinkPad, despite having a house full of Apple laptops. That's because Apple could offer nothing with comparable size and weight. It was worth putting up with Windows or Ubuntu to gain the convenience of a smaller lighter machine. 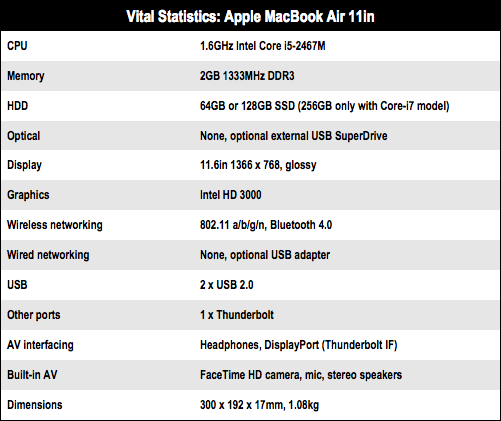 This changed when Apple introduced the Air in January 2008. With the Air, Apple had made much of the computer disappear. The machine contained the bare minimum needed to house a screen and keyboard, and to protect them from knocks. But all this came at a cost. The Air lacked a dedicated Ethernet port and expansion was limited to one USB port. Neither the hard drive nor memory could be upgraded by the user; the battery was sealed and could not be replaced. And performance suffered from a slow, small hard drive (if you didn't choose the SSD option) and a perishingly slow custom Intel processor. A cost that, for me, that was too high. Last year the lonesome Air became a “product family”, of sorts. With the latest crank of the handle, Apple has addressed many of the original issues, adding multichannel, high throughput Thunderbolt port, and an Intel Core i5-2467M quad-core Sandy Bridge processor. And rather than being a luxury item, the Air design is now, incredibly, the entry-level Apple notebook. But this Jobsian Wonderland is a parallel universe. Here, the term 'entry level' is relative. 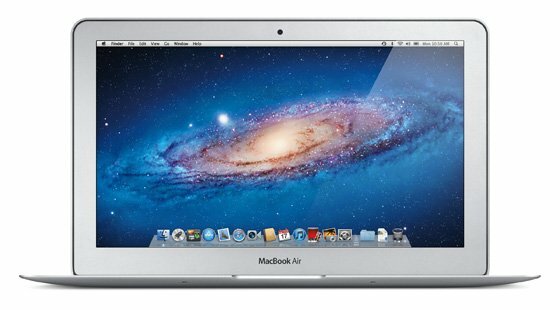 You can buy two powerful Wintel laptops for £999, which is how much an 11in Macbook Air (with 128GB drive) costs. You can probably find three quite passable ones. Reg Hardware reviewed the latest 13in Air recently, but on test here is the entry-level model: the cheapest Apple portable "experience" available. What's it like?